Bikaner Camel Festival is an annual festival dedicated to the ship of the desert. Organised by Rajasthan Tourism in the month of January, the celebrations include camel races, camel milking, fur cutting design, best breed competition, camel acrobatics and camel beauty pageants. The camels themselves are beautifully bedecked and form a colourful spectacle against the red backdrop of the Junagarh Fort. There’s plenty of scope for eating, souvenir-shopping and photography at this festival. Other sights to watch out for include the skirt-swirling folk dancers, fire dancers and the spectacular fireworks show, that lights up the night sky above the fortified Desert City. The Nagaur Fair is the second biggest fair in India. Held every year between the months of January and February, it is popularly known as the Cattle Fair of Nagaur as this is where owners gather to trade animals. Approximately 70,000 bullocks, camels and horses are traded every year at this fair. The animals are lavishly decorated and even their owners dress up with colourful turbans and long moustaches. Besides cattle, sheep, horses and even spices are traded. Other attractions include the Mirchi Bazaar (largest red chilli market of India), sale of wooden items, iron-crafts and camel leather accessories. Several sports are also held during the fair. These include tug-of-war, camel races and bullock races. Nagaur fair is also famous for its jugglers, puppeteers, storytellers, etc. Once a year, the empty sands around Jaisalmer come alive with a mesmerising performance on the sand dunes in the form of the Desert Festival. The festival, organised by the Department of Tourism around January-February, goes on for three whole days and lets you enjoy the rich and colourful Rajasthani folk culture. Rajasthani men and tall, beautiful women dressed in their best and brightest costumes dance and sing ballads of valour, romance and tragedy, while traditional musicians attempt to outdo each other to showcase their musical superiority. The high points of the festival are puppeteers, acrobats, camel tattoo shows, camel races, camel polo, traditional processions, camel mounted bands, folk dances, etc. To experience the colour and joy that fills the people of Rajasthan, visiting Udaipur during the Mewar festival is a highly recommended experience. The festival is observed to welcome the arrival of spring. The spirit of the festival can be seen throughout the state, but since Udaipur has always been the governing place of Mewar rulers, one can observe the distinct flavours of the festival here. The whole of Udaipur gets drenched in vibrant colours. Local markets and shops decorate their facades with bright lights and decorations. 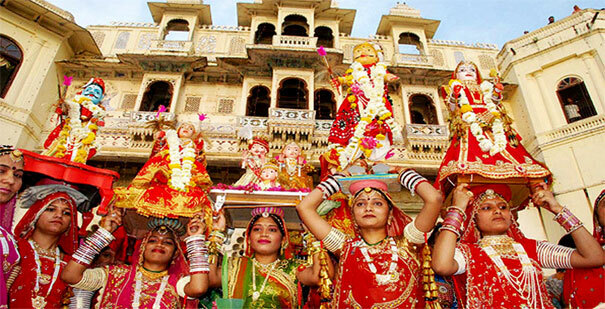 Coinciding with the Gangaur festival, the Mewar festival is equally significant for the womenfolk of Rajasthan. The festival is especially meant for women and presents them with an opportunity to dress in their finest and join the celebrations. 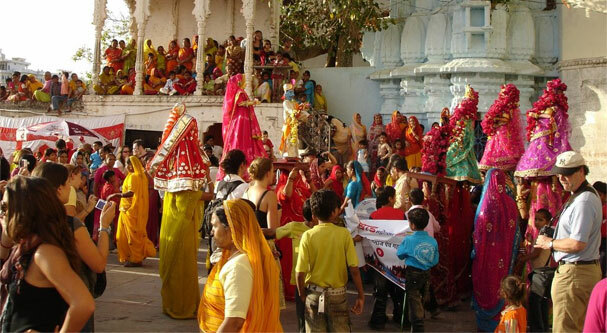 Women assemble to dress the images of Isar (Lord Shiva) and Gangaur (Goddess Parvati) and carry them in a procession through the city, finally immersing them in the middle of Pichola Lake. Dances, songs, cultural events and a firework display are highlights of the festival.